A Common sales method is wrapped within how individuals make buying decisions - Part 3. We ended part 2 with consultative based selling stages aligned with how individuals make buying decisions, the customers buying process. In part 3 we move into the details of creating a common sales method to build out the final leg of our 3 legged stool on how to align sales and marketing. The next step is to drill into the sales stages and match up the potential detailed sales steps with how customers buy your products and services and help configure a common sales method. 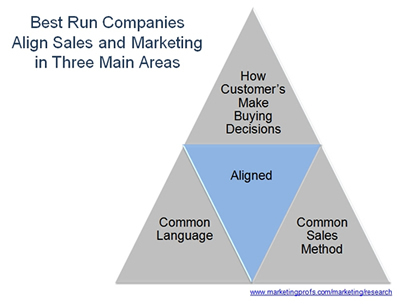 To create the Best Buying Experience, align the sales methods with how customers make buying decisions. Tip 1: Let's start out with what can be one of the more difficult areas to gain consensus between sales and marketing, before we jump into the detailed sales steps of a common sales method. What is a Lead? Current practice is to define a "marketing lead" and a "sales ready lead". In aligned companies, marketing is responsible to nurture marketing leads until the individual says, "tell me more" and they begin to identify needs. The individual at this point is moving from a latent need to an active need. When an individual moves from a latent to an active need, they begin to focus on the people who can help them the most. It is at this point individuals want to engage with people who can have business conversations around their needs and potential ways to help them achieve their needs. Shortly after marketing identifies an active need with a marketing lead, begin the transition to sales as an active buy-sell cycle. It is a gray area and each business needs to review current and planned resources, (personnel),and determine the best point to transition. Tip 2: In aligned companies, marketing is measured on the percentage of orders in the sales funnel which were initiated by a marketing lead. Meaning leads obtained by marketing demand generation efforts, not referrals or leads sales discovered with their own efforts. Marketing is also measured on the leads which transition to a sales ready lead. It is no longer a numbers game to generate 1000's of leads. Marketing is held accountable to obtain leads where the potential prospect will say, "tell me more". With marketing feeding better quality leads to sales, conversion of sales ready leads to orders is now a meaningful ratio for sales. Sales people are held accountable to manage and convert sales ready leads to orders, in addition to their normal quota's. 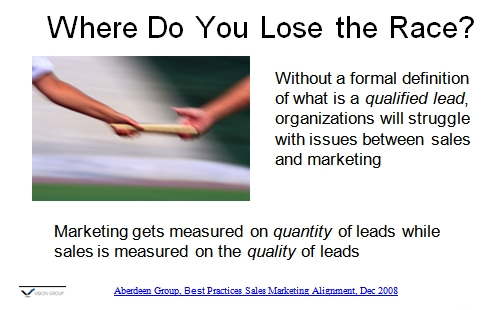 Paradigm: It is not about the quantity of leads marketing generates, it is about the quality of the sales ready leads. Tip 3: The customer focused messaging in part 1 was built around individuals by title and market who are the key decision makers when buying products and services. Capture the important attributes in the lead management system and use a cross functional team of sales, marketing and subject matter experts to improve the effectiveness of demand generation tools used by both sales and marketing. then it is to know which demand generation tools work the best when trying to obtain higher quality leads for sales. The top bar below represents the 4 buying phases an individual goes through while making a buying decision. 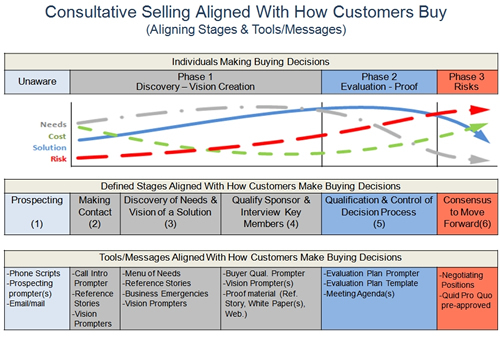 In the second bar, we list out 6 consultative based sales stages. 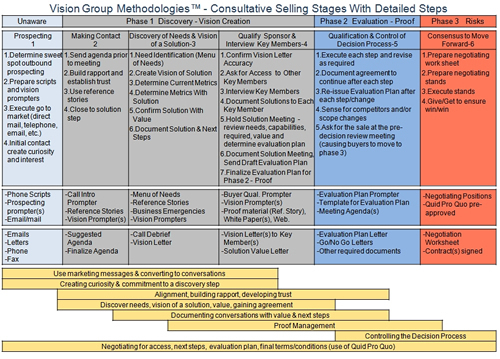 Below the 6 sales stages are potential detailed steps within each stage. Depending on the type of product or service groupings, it is not uncommon to have different detailed sales steps. The top level sales stages stay the same across the company. These are lined up with how individuals make buying decisions, whether they make the decision directly, or as part of a buying committee. When reviewing the sales stages recall there can be only one decision maker with certain product or service groupings in your company . This means for those products or services, there will be fewer detailed steps within the stage. However, the individual making the buying decision will still go through all of the buying phases, whether they do this with your sales people or by themselves. Many people ask us, can an individual go through all of the buying phases in a single sales call? If you are facing a single decision maker, and it is possible to discover their needs, move to a solution, define the value, offer acceptable proof and receive a verbal order in the call, then the answer is yes. shown in the diagram above, a common sales method can be used across the sales channels. 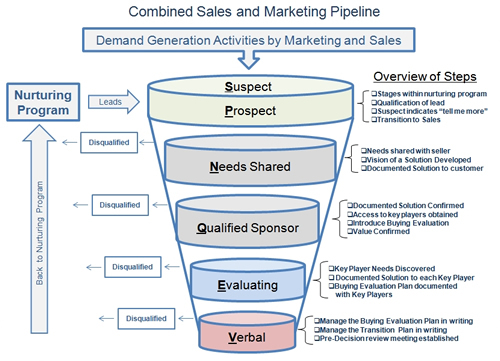 Tip 5: With a common sales method, we can now define a combined sales and marketing pipeline, (also called a funnel). The diagram below depicts a combined funnel-pipeline with a nurturing program. The detailed steps on the right hand side need to be modified to fit the detailed steps defined in Tip 4 above based on the product or service grouping under review. One of the questions we receive when people look at this diagram, "Should I consider a nurturing program"? Based on Warren Culpeper, The Culpeper Report, 80% of prospects who decline to buy today will buy similar services within 18-24 months. In conclusion, using the tips from above and those in part 1 and part 2. Companies can begin the alignment of sales and marketing around how their customers buy their types of products and services. Using a common language and a common sales method.